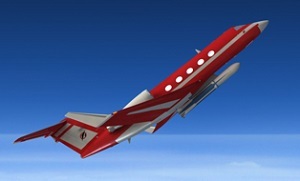 GO plans to develop a suborbital space launch platform to conduct microgravity and hypersonic research (GOLauncher 1) and later, a dedicated orbital launch platform for nano and micro satellites (GOLauncher 2). Test flights are expected to begin at Cecil as early as 2014, with operational launches forecast to begin in 2015 and 2016. As part of the memorandum of understanding signed on December 18, 2013, JAA will make available to GO at a mutually negotiated rate, hangar space and payload integration facilities, rocket storage facilities, office space for GO crew and staff, range equipment and launch command and control facilities and equipment. Additionally, GO will have access to runway facilities, rocket test areas, coordination with FAA range authorities and air traffic control. The agreement between JAA and GO is for an initial period of two years, with the option to renew for three, one-year terms. Matching a $1.8 million grant from the Florida Department of Transportation (FDOT), Space Florida and FAA received earlier this year, JAA intends to make additional investments to support space launch systems like GO in the next two years. The Jacksonville Aviation Authority operates Jacksonville International Airport (JAX) and the city’s three general aviation airports – Cecil Airport, Jacksonville Executive at Craig Airport (JAXEX) and Herlong Recreational Airport. The Authority, funded through user fees and not local taxes, generates over $2.9 billion annually to the local economy. For more information about the Jacksonville Aviation Authority’s airports, please visit www.flyjacksonville.com.